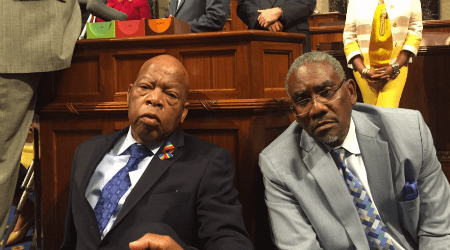 It was almost midnight when I found myself glued to the live video of scores of Democratic congressmembers then about twelve hours into their historic sit-in. They were occupying the House chamber, jerry-rigging a social media-based broadcast when the Republican leadership shut-down the C-Span cameras, rising one after another to speak with passion, reminding the nation that business as usual is no longer okay. They are proud of themselves and each other, as they should be. They are grateful to civil rights icon and Georgia Congressman John Lewis who has been leading them in speaking truth to power. By late morning Thursday they were continuing to occupy the House. Despite the Republican leadership announcing that the House is not in session, they are insisting that there be no congressional recess without voting on the proposed bills, and they are demanding that the public, filling the galleries, be allowed to stay. They are reminding the world that since 1968 more Americans have been killed in gun violence than in all the wars in US history. They are demanding a vote on gun safety laws. It’s a moving, empowering thing to see. It’s rare, powerful, and should be applauded. And yet. There’s a huge problem. The two proposals the Democrats are demanding a vote on are very problematic. One bill proposes only a small, completely insufficient expansion of background checks. The second would not only be ineffective in preventing gun violence, but would cause a dangerous increase in racial profiling and Islamophobia. That second bill is the basis for the slogan “no fly, no buy” – which refers to making sure that no one on law enforcement’s so-called “no-fly” lists is ever allowed to buy a weapon. If we were talking about actually preventing real terrorists from buying weapons, that would be a no-brainer. But the “no-fly” lists are not lists of terrorists; they are lists of people – American citizens, green-card holders, visitors, citizens of other countries – who end up on the FBI’s or other law enforcement agencies’ lists for reasons we and they never know. Maybe they share a name with someone once suspected of knowing someone whose second cousin once skyped with someone thought to be a would-be terrorist. Maybe their college roommate ended up trying to go to Syria. For some few of them, maybe they really do have dangerous intentions. But there are thousands of people on these lists. Most of them can’t even find out why they’re not allowed to fly, let alone succeed at challenging the prohibition. We should not forget that President Nelson Mandela remained on the US “terrorist” watch-list until 2008. What the American Civil Liberties Union calls our “error-prone and unfair watch-listing system” doesn’t produce a list of terrorists at all. And we know that those “vague and overbroad criteria” end up being applied disproportionately to Muslims, Arabs, South Asians and others wrongly assumed to be linked to terrorism. It is terribly sad that some of our most principled, consistent members of Congress – members of the Black Caucus, the conscience of the Congress, and the Progressive Caucus, whose members work against racism, against racial profiling, against Islamophobia and hatred, against war and beyond – are among those accepting and urging even greater reliance on this “error-prone and unreliable” system in the name of preventing gun violence. The Democratic leadership is refusing to allow their now-insurgent party to officially endorse the most sensible (however insufficient) versions of gun control laws: outlawing assault weapons, removing the prohibition on federal research on the public health consequences of gun violence, and universal background checks. Those things, lethally opposed by the NRA, would not stop the epidemic of gun violence in this country but unlike the no-fly lists they would certainly help. Some in the sit-in rejected those restrictions. At 12:35 in the morning, Texas Rep. Beto O’Rourke, one of those who had set up the live-streaming of the debate after the Republican leadership turned off the cameras, rose to call for all three of those goals. The congressional sit-in is bringing moral power and renewed urgency to the cause of gun control. Watching the Democrats shout down Republican leaders desperately trying to reclaim control of the House might challenge the partisan bickering that has paralyzed Congress for years. It may mark the beginning of a turn towards the re-legitimation of Congress, long demonized as the least effective, least useful, least popular institution around. That renewed legitimacy, though, would be far more likely achieved if these members of Congress, as they consolidate their new moral credibility, would finally reject the current iteration of “no fly” lists as the basis for gun control – or indeed, as a valid method of counter-terrorism. The Congressional sit-in protesters should be congratulated for standing up for their principles. And they should be pressured to make sure their plans to act on those principles don’t undermine other principles of civil rights and equality. This entry was posted in PPJC Picks and tagged Congress, Domestic Issues, gun control by TD Daniell. Bookmark the permalink.